the need for incorporating global best practices in Early Childhood Education systems in India, including integration of technology and learning through play. teachers from various schools in the city. 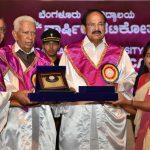 Founders of these institutions were felicitated in appreciation of their contributions to Early Childhood Education. Those who were felicitated were Ms Pushpa Dhawan and Nidhi Dhawan of Happy Hours, Ms Nadia Moghbelpour of Blossoms School, Vimaljit Dua of Ruchika School, Ms Poly Patnaik of Mother’s Public School, Kasturi Mohapatra, former Chairperson, State Commission for Protection of Child Rights, Ms Mala Mishra of DPS Kalinga, Ms Monalisa Bal of KIIT International School, Ms Sikata Das of BMPS Takshila, and Ms Sudha Mishra of Little Steps Preschool. benchmark daycare programme, we facilitate mothers to go back to work after childbirth, and, hence we play an important role in gender balance and empowerment of women. The age-group 0-5 years is crucial for brain development and this is where early childhood education systems play a defining role in the life of children. We are happy to have brought together the entire community of early childhood educationists, especially, the pioneers in this field, whom we are honoured to be felicitating today. We believe that collectively, the community can share resources and address various needs in order to integrate best practices into curriculums and pedagogies in their early childhood education programmes. 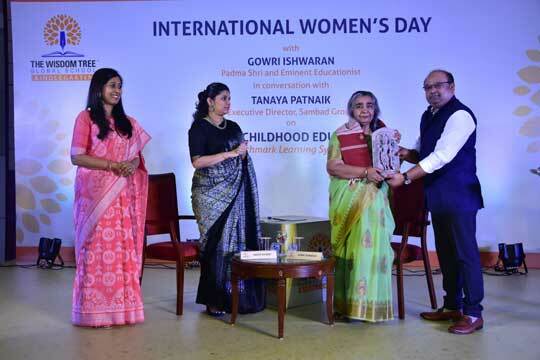 Shri Jagadish Prasad Naik, Chairman, The Wisdom Tree Global School welcomed and felicitated Padma Shri Gowri Ishwaran. In his words,his dream is to ensure that the finest educational facilities of global standards are made available to the children of our state so that our children become empowered citizens of the world. The program was attended by Trustees of the school, as well as, a large number of teachers, education practitioners, parents and eminent personalities of Bhubaneswar.